I have a vase, referred to by my family as an umbrella stand, that was owned by my grandparents and it is at least 60 years old. It may be quite a bit older. I believe it was probably purchased by my great aunt who lived in New York City around the turn of the twentieth century. 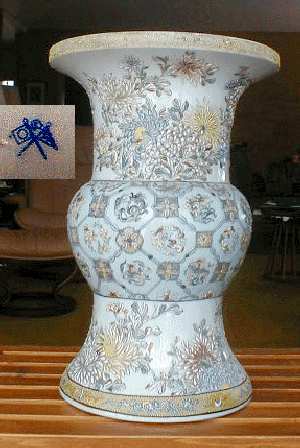 The vase is about two feet high and is made of porcelain or other ceramic material. It is decorated with raised floral designs and what appear to be serpents or dragons. There is a stamp on the base of crossed flags showing a crescent moon and a star and some other design I cannot make out. I am submitting some photos. A man in Syracuse who identifies antiques said in his opinion it was Chinese export probably made in the early nineteenth century. To me it seems like your vase is Japanese and from the first decades of the 20th century, and somehow connected to the Satsuma style in its decoration. The flowery top and bottom parts of the decoration are truly Chinese in style and feel. The flowers are Chrysanthemums - in China both the flower of the autumn season, and referred to in Chinese poetry as a symbol of scholars withdrawing from service rather than serving new rulers. The middle section with it basketry design is on the other hand Japanese in style and the raised decoration as a whole what we expect from the Japanese Satsuma kiln. The base mark is interesting. It does never - as far as I know - occurs anything like that in China, earlier than mid 20th century. Looking at how clear the mark is, it also looks like it has been applied to a porcelain body that has already been fired. The thing is, no Chinese porcelain bodies was ever fired more than once and all underglaze decoration was always painted on unfired pieces meaning from this reason alone the piece needs to be Japanese in origin however Chinese in shape the vase is. The mark itself, finally, seems to consist of a Japanese square flag combined with the old Chinese triangular Imperial flag. In between the two flags seems to be a star and a crescent moon. The only instance when this logically could have occurred is - again as far as I know - during the Japanese occupation of China in the mid 1930s but I am not entirely sure if this vase is not a bit older than that. This would coincide nicely with your indication that this vase being "at least 60 years old". All in all this is a nice and interesting piece, and the curious mark makes it even more interesting. All in all I would like to suggest that this vase is Japanese in origin and decorated in Satsuma style. The mark being applied to what appears to be an unfired porcelain body also suggests that the vase is Japanese in origin. The mark is also that of the North American importing company A A Vantine & Co that was active in these years. More information could be found under this headline in the Japanese Marks section, under A A Vantine. However great the similarities is, it is not recommended to be entirely sure based on pictures only.